(ii) consciousness-raising events and activities. Ideal for anyone seeking more out of Self and Life. The form of yoga we practise is referred to as Kundalini Yoga as taught by Yogi Bhajan. Yogi Bhajan (1929 – 2004), Master of Kundalini Yoga and White Tantric Yoga, introduced this ancient sacred science to the west in 1969. 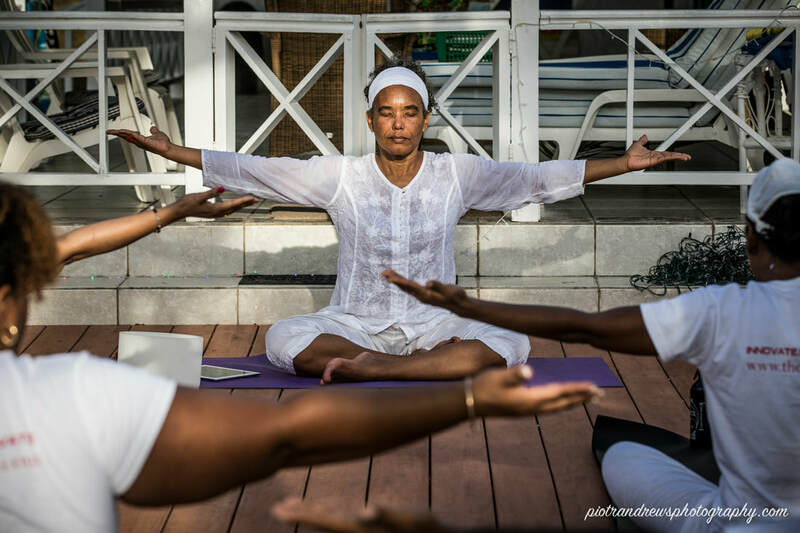 Also referred to as “the householder’s yoga” on account of its powerful, fast-track nature, Kundalini Yoga is ideal for those who seek expanded consciousness amidst the daily challenges of today’s world: jobs, businesses, families, social pressures and general stressors. Kundalini Yoga combines specific postures (asanas), breathing techniques (pranayama), hand positions (mudras), meditation and the use of sound vibrations (e.g. mantras in the ancient sacred languages of Sanskrit and Gurmukhi). Together, in prescribed sequences, these create specific, positively transforming effects. Kundalini Yoga is not a religion. As with any form of yoga (derived from the Sanskrit word yuj meaning ‘yoke’), it enables one to achieve union with the Divine/one’s Higher Self. The following two mantras are chanted to tune in before practicing Kundalini Yoga. This mantra connects you to your Inner Teacher and to the Golden Chain (Masters/Teachers throughout time). It guides and protects. I call upon the Infinite Creative energy of the Universe. I call upon Divine Wisdom. This mantra surrounds you with a protective shield of light. Sing the Kundalini Yoga Farewell Blessing at the end of each class. Then chant three long Sat Nams. Sat = Truth, Nam = name/identity. Founder of Thou Art Yoga, Elspeth Duncan (Tek Har Kaur), is a multimedia creator (writer/journalist, musician, film maker, photographer, animal rescuer/advocate) and KRI certified Kundalini Yoga instructor who has been practising this powerful form of yoga since October 2000 and teaching since 2002. ​She currently lives in Tobago, West Indies.